Today marks the 25th anniversary of Twin Peaks: Fire Walk With Me, director David Lynch's prequel film to his seminal television series. Upon its release on August 28, 1992, the movie was greeted with horrible reviews, the worst for David Lynch since Dune. The overwhelming feeling was "why are you still here? The party is over." Twin Peaks had been a pop culture phenomenon for the spring and summer of 1990, but upon its second season, the show was moved to Saturday nights, killing its ratings. David Lynch and co-creator Mark Frost's refusal to to answer the question of "who killed Laura Palmer?" annoyed casual fans, who abandoned the show in record numbers. By the end of year two, the show had been preempted and moved around so many times, only diehard fans saw the final episode on June 10th, 1991. But Lynch wasn't done with Twin Peaks, even if most of America was. He decided that his next film would be a prequel film, focusing on the last seven days in the life of Laura Palmer. The movie was ten times as surreal as the show, and introduced countless new elements to the Twin Peaks mythos in roughly two hours. The film was meant to be the first of several Peaks-related films, but the critical and commercial backlash the film suffered made Lynch put the series on the shelf for a very long time. (For more on Fire Walk With Me's original production and release, be sure to read our full Twin Peaks Revisited edition all about the film). Since 1992 however, the film has been critically reevaluated and is now seen as one of the most interesting things in Lynch's entire oeuvre. And when Lynch and Mark Frost returned to Twin Peaks with the currently running Showtime series Twin Peaks: The Return, they drew heavily from Fire Walk With Me, making the film a truly essential part of the overall story of Twin Peaks. Below we've cataloged the most key story elements introduced in the film that factor heavily in the new series. In the opening moments of the movie, FBI Agents Chet Desmond (Chris Isaak) and Sam Stanley (Kiefer Sutherland) meet Director Gordon Cole (David Lynch himself) to discuss a new case they've been called to investigate, the murder of a local Washington state girl named Teresa Banks. Instead of just giving Desmond a case file, Cole presents him with a dancing girl in a red wig named "Lil", whose every action, from walking in place to making a sour face, is code for something related to the crime. She also has a blue rose pinned to her dress. What does the rose signify? As we discover later in the film, the blue rose is symbolic of one of Gordon Cole's supernaturally inclined cases. Cooper even refers to the Teresa Banks murders as a "blue rose case." It's not until The Return that we learn more about the backstory of these Blue Rose cases, how they got their name, and how the entire FBI "Blue Rose Task Force" was formed. In the opening portions of the movie, we meet the curmudgeonly Carl Rodd, played by legendary character actor Harry Dean Stanton. Rodd is the owner of the Fat Trout Trailer Park in Deer Meadow, Washington, where murder victim Teresa Banks lived before she died. the FBI go to visit him and ask questions, even though the sign on his door explicitly states "not to be bothered before 9.AM ...EVER"
90-year-old Harry Dean Stanton came back as Carl Rodd in The Return, having relocated his trailer park to Twin Peaks from Deer Meadow. Aside from getting a musical number to himself, one of the most pivotal scenes for his character this time out was witnessing a hit-n-run accident that killed a little boy. In the film, BOB's victims, Teresa Banks and Laura Palmer, each wear a mysterious ring, with the symbol of an owl carved in jade at the center (the symbol was seen a glyph carved into a wall in Owl Cave on the series). The ring is some kind of conduit to the Black Lodge. Those who find it are either transported there physically (like Chris Isaak's character) or spiritually upon death, like Laura Palmer. The Owl Cave Ring reappears in Twin Peaks: The Return, initially on Agent Cooper's second doppelganger, Las Vegas insurance agent Dougie Jones. Cooper's evil doppelganger flunkie Ray Monroe was given the ring by a man dressed as a prison guard in South Dakato. Evil Coop eventually ordered Ray to put on the ring, and then shot him. The ring disappeared, then landed on the floor of the Black Lodge. Ray's corpse appeared there too, and the ring was then placed on a table. It's obviously super important to the events of The Return, and it was created specifically for the movie. 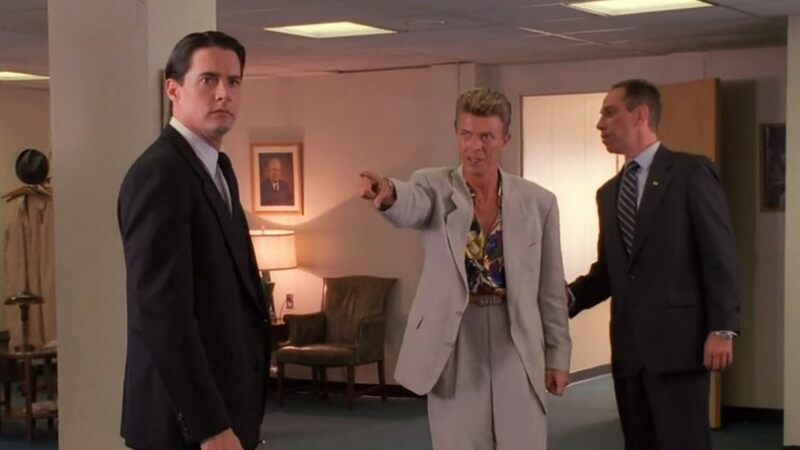 In one of the most memorable cameos he ever filmed by David Lynch, late rock legend David Bowie appeared as a long missing FBI Agent named Phillip Jeffries. In a brief moment, he appears out of thin air in FBI headquarters, and describes a meeting "above a convenience store" with various Lodge entities. He points at Agent Cooper and says "who do you think this is there?" before mentioning that he's "not going to talk about Judy." Despite Bowie's untimely death, his character of Phillip Jeffries looms large over The Return, as we learn more about what he meant, not only his reference to Cooper, but also the mysterious Judy. Realizing that you can't recast a legend like Bowie with just any actor, Lynch instead recast him as giant tea kettle. Because that's what you do when you're David Lynch. "My Name is Annie. I've been with Dale and Laura. The Good Dale is in the Lodge, and he can't leave. Write it in your diary." As we find out, those pages were taken by Leland Palmer/BOB, who hid them in the door of the bathroom stall at the Twin Peaks sheriff's station, 25 years before. Those pages let Deputy Hawk know in The Return that the real Dale Cooper is not the one who emerged from the Black Lodge, but his evil doppelganger. At the end of the film, after Laura Palmer has been murdered, Leland/BOB returns to the Black Lodge, where MIKE (the Little Man from Another Place) and Phillip Gerard tell him they want back "all their Garmonbozia (pain and sorrow)." In The Return, when Evil Coop and the original Dougie Jones are meant to return to the Lodge after their 25 year reprieve is up, they begin to uncontrollably vomit up a yellow substance that looks suspiciously like cream corn. It's a totally gross moment, but it is definitely a call back to Fire Walk With Me. Are there other callbacks to Fire Walk With Me in Twin Peaks: The Return that you think we might have missed? And what are your overall feelings about this polarizing film? Let us know down below in the comments. GAME OF THRONES: What Secret Weapon Is Gendry Building for Arya?!? Parks and Rec’s Wildest Fan Theories Crossover Our Favorite Shows! The Best GREAT BRITISH BAKING SHOW Cast Reunited for Martha's Wedding! How Powerful Is Saitama's Serious Punch? 2 New TWILIGHT ZONE Trailers Preview "The Comedian" and "Nightmare at 30,000 Feet"